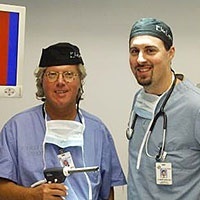 The Society of Elite Laparoscopic Surgeons is a non-profit organization based in Chandler, AZ, existing for the purpose of promoting access to minimally invasive surgery in the United States, and to lobby and promote the transition of the US medical system to adopt minimally invasive hysterectomy as standard of care. The organization is made up of member gynecologic surgeons, and holds annual meetings in various locales. The group received attention in December 2008, when members Richard Demir MD and Greg Marchand MD received a Guinness World Record for their successful removal of a 3200 gram uterus without resorting to laparotomy.